My wife left with some friends to celebrate her birthday in Wynwood a few minutes ago. I think their first stop was Concrete Beach Brewery. 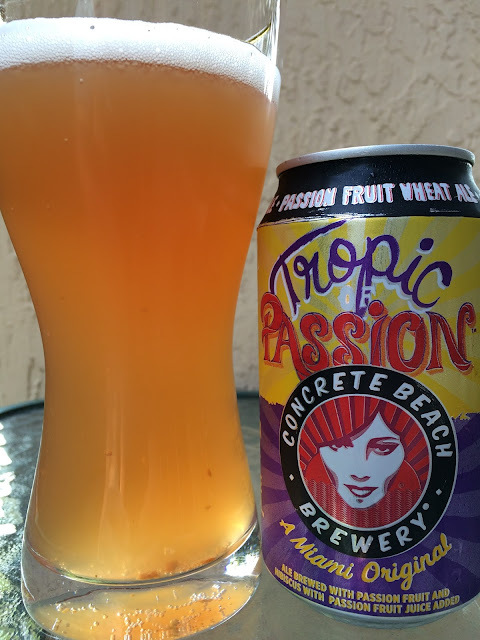 So as I waved goodbye, I cracked open a can of Tropic of Passion Passion Fruit Wheat Ale, canned at the brewery pretty recently though the enjoy before date supposedly stamped on the bottom of the can was MIA. Get it? Nice purple and yellow artsy can design. I did try this beer at the brewery at a party back in November, but decided to check out a full can. LOTS of floaties! That, by the way, it NOT a knock, just an observation. I love me some floaties! They are tasty. VERY fruity, tangy aroma with plenty of passionfruit. Flavors follow, fruity and full of passion fruit. Wheaty twang, some flowery component, and some spicy elements. Lightly tart. And while the initial flavors aggressively jump on you, they just as quickly limp away and drop out completely. Mega to mini in a few seconds, then left with just a bland finish. Was OK.